Easy lunch and a great excuse to try jicama if you haven’t already. 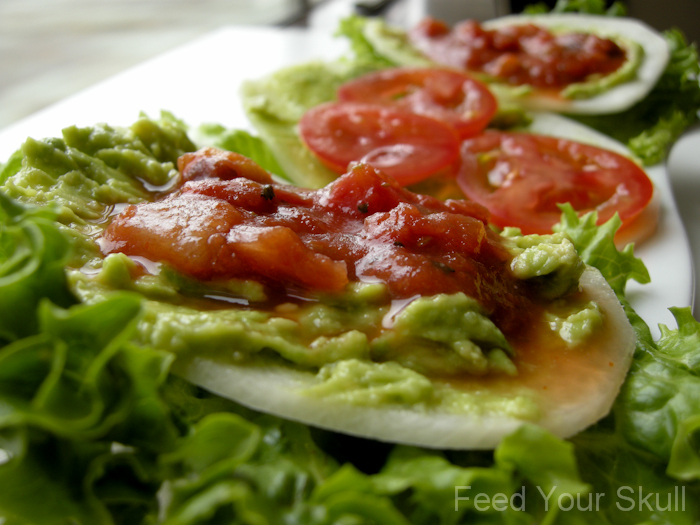 I didn’t even think of Cinco De Mayo, but this would be perfect to take to a party, it’s a snack that even non-raw foodies would enjoy. 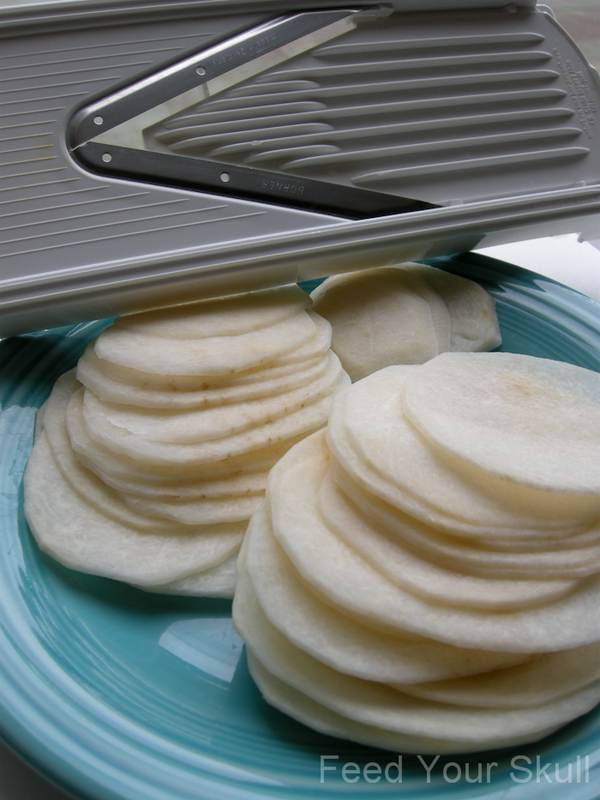 Also the jicama slices are fresh, not fried and handle the weight of the heavy wet salsa and guacamole like pros! Jicama, in my mind, is like a cross between a potato and an apple. It is heavy and dense like a potato, but not starchy and has the lightness of an apple but not the sweetness. 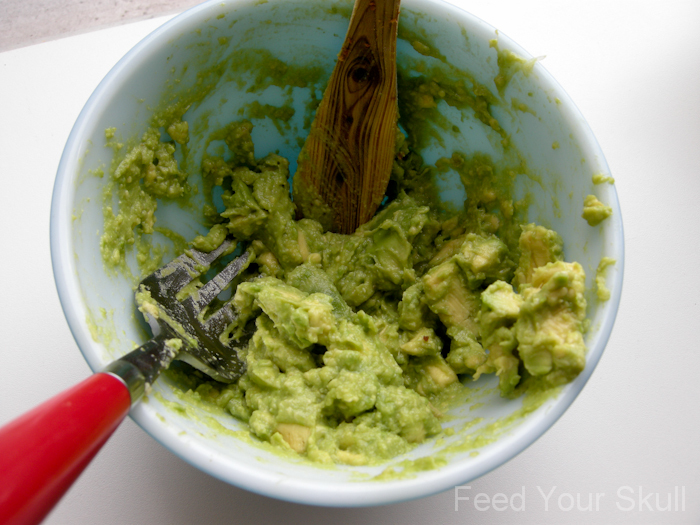 My first time trying it was with a sprinkle of salt and splash of lime juice – divine! The second time around, I followed a Victoria Boutenko recipe and cut them into ‘french fry’ shaped strips and marinated them in a little olive oil, garlic powder, and cayenne – also delicious! Jicama, also known as the Mexican Yam, is composed of 86-90% water and is very high in vitamins C, A, and B and even contains the minerals phosphorus and calcium. [wikipedia] This globe of a tuber can be found near the peppers and sometimes onions at your local grocery store. The one I used was about 3-3.5″ in diameter around the thickest part – very similar to small tostadas. Go with your favorite guac recipe or my ‘in a snap’ version. 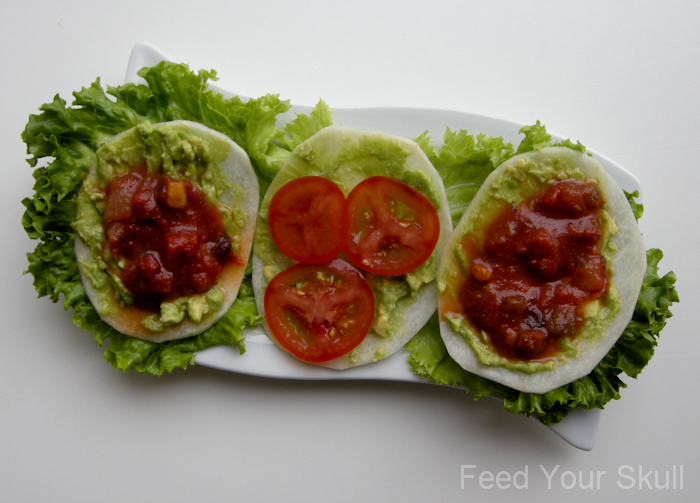 For the salsa, I used store bought organic, but feel free to make your own, if you have time. To assemble, peel your jicama and remove the knobby ends. Cut into very thin slices using either a knife or a mandolin. I prefer the mandolin to a knife -it’s quick and makes perfectly even slices over my endearing but wonky ones. Next step, lay your slices out and spread a little guacamole and then a little salsa on top, feel free to sprinkle with minced onion, chopped cilantro or shredded cabbage. These also make a great lunch. Hint. Hint.